Acquired from the above by the present owner circa 1975. J. Baron, Anthologie plastique du surréalisme, Paris, 1980 (illustrated p. 198). D. Filipacchi (ed. ), Grands Peintres, no. 47, Joan Miró, Paris, 1988, p. 11. New York, The Solomon R. Guggenheim Museum, Surrealism: Two Private Eyes, June - September 1999, no. 599 (illustrated vol. 2, p. 703). This work is sold with a photo-certificate by Jacques Dupin. Sans titre belongs to the period in the early 1930s when Miró was moving beyond the dreams and whimsical fantasy that had characterised his Surrealist work and into a new area that favoured direct expression in a new, rougher and more vigorous form. Using the Surrealist technique of chance association and an almost sculptural form of assemblage of predominantly found objects and discarded raw material, Miró was attempting to avoid the mannered traps and habits of conventional painting in his work. Deliberately raw and crude and using unconventional means and materials, he was at this time working in a way that almost blindly followed his intuition in the attempt of going beyond the boundaries of what was considered 'art'. Executed in October 1933, Sans titre is a drawing augmented with cut-out photographic material drawn from medical journals, a postcard of cows in a landscape and, a favourite theme of Miró's, a dancer, that lyrically combines all these seemingly random elements into a vaguely comprehensible whole. 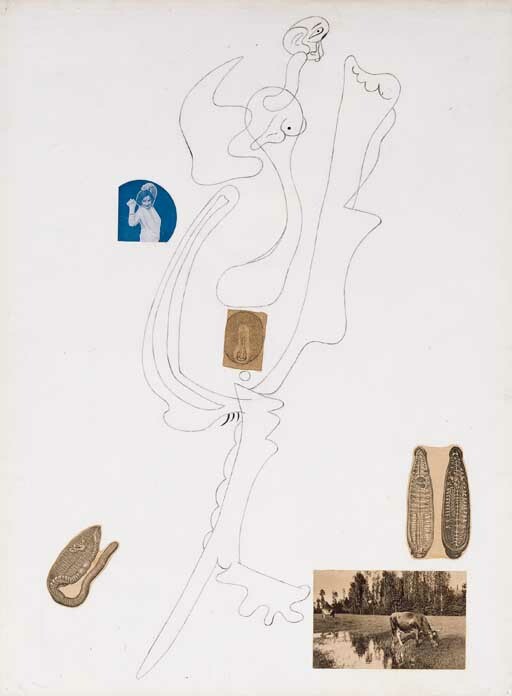 Combining its lyrically drawn figure with printed anatomical diagrams that speak of a rational exactitude and logic completely alien to the artist's poetic nature, this work reflects Miró's aim of transcending all previous pictorial language in order to create an entirely new form. Sparse, direct and yet strangely whimsical, each element in the work forms a bizarre dialogue with the others to create a surprisingly lyrical and united play between seemingly disparate worlds of imagery and the imagination.